In our ever increasing technological world, glitches and crashes that are a result of error have become a part of our culture. Interaction with machines has evolved and random occurrences are evermore present and disrupt everyday life. Mistakes or errors are due to fault within a system or process. It is an event that can provide a sense of curiosity; similar to the idea of the punctum. According to the french philosopher, linguist, critic Roland Barthes the idea of the punctum can be applied within contemporary culture. 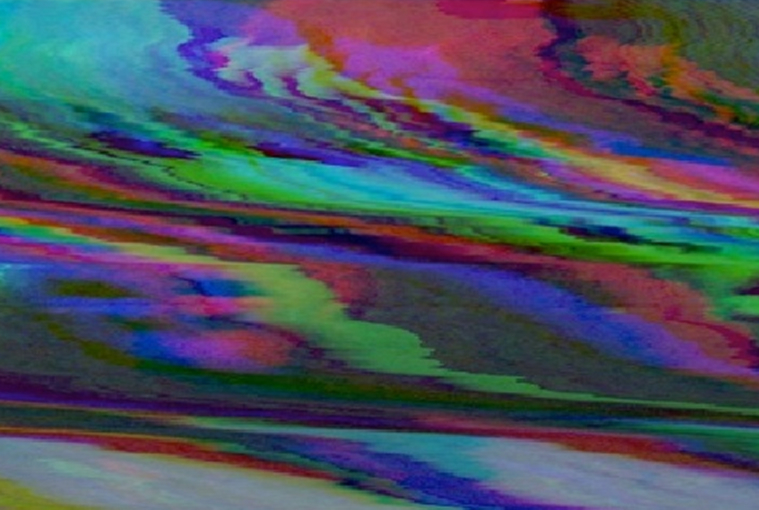 What Barthes tries to uncover in photography, can be examined in regards to glitch art. In his text “Camera Lucida”, Barthes refers to photography as the medium when describing the punctum. 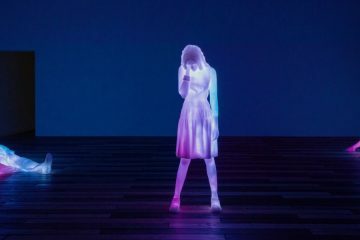 The concept of the punctum can be applied to his idea not just with photography but with the media technologies that now exist, as every medium has possessed it own glitches. James points out that in an interview Virilio explains his theory of the accident “There is no technical invention without accidents. Each time a technology is invented, a technology of transport, of transmission, or of information, a specific accident is born”. Revisiting his idea 40 years later, there is now the digital to consider. Is the punctum present in digital new media? Barthes observes that there is a Latin word that exists he draws from to describe the affect. Homer claims that, as Victor Burgin has pointed out, “trauma” derives from the Greek word for “wound”; its Latin equivalent is punctum. In his definition of the punctum Barthes describes the different elements of the qualities of the punctum, as being speckled with sensitive points and piercing him. The punctum provides a point of reference or identification, it disrupts, pierces and fascinates the gaze. Gallop in her essay “The Pleasure of the Phototext” says that the punctum breaks through to allow “life” to pass through. This is a quality inherent in technological accidents of the machine, it is these errors that break through to provide the punctum. Barthes describes the punctum as disturbing the “studium” (the everyday) with a “sting, cut, little hole”. Gordon Hughes in his essay “Camera Lucida” asserts that the punctum gathers what is dead, what is going to die, oddly suspended like a ghost, between life and death. Just like a glitch the punctum presence is like a ghost in a machine, and what is dead could be comparable to a dead pixel. “Very often the punctum is a detail, i.e., a partial object”. In glitch art there is appreciation of that detail, the partial object perhaps being a random pixel. To draw comparison, we must aim to understand what is a glitch. To do this we have to look back at the origins of the word. One definition is that “The word glitch itself has its provenance in the German word glitschen, meaning to slip” (Mitchell). Another explanation is the use of the word by NASA engineers and astronauts: “It seems to first come into the vernacular in the 1960s and ’70s — in the context of small, unforeseen technical errors in space travel.” (Siner). Its use in terms of popular culture came to light when used to describe an error in mechanical equipment in space described by John Glenn’s “Into Orbit”, a 1962 account of Project Mercury. Its first use in English was in 1962 during the American space program in John Glen’s comment: “Literally, a glitch is a spike or change in voltage in an electrical current.” A glitch that is unintentional and problematic in a circuit for an engineer, can be the most interesting punctum within artistic discourse. In the surreal landscape of the digital age we are surrounded by images; an overload of saturated media. There is a demand for high quality and expectations of technology to produce seamless perfection. Technical failure in digital technology can disrupt our viewing experience, we are used to seeing and expect a seamless flow of information on screens. What happens when the technology fails? There is a glitch. Artefacts emerge as unwanted corrupted digital code and data within the machines we use. In terms of a contemporary context Moradi discusses that due to the pursuit of signal perfection, a higher definition in consumer electronics, glitches are eliminated in milliseconds. When referring to glitches Moradi suggests that “at times they completely steal the limelight”. This effect could also be considered a trait of the punctum. Barthes says that a photographs punctum is an accident that pricks but is also poignant. A glitch within any medium is an accident and is disturbing to our senses. Vernacular of file formats is presented as distorted images, due to our cultural reading within the digital realm we recognise that there are errors. The image is not perfect, it is not necessarily the cultural interpretation of the face, eyes or the expressions that is of interest. 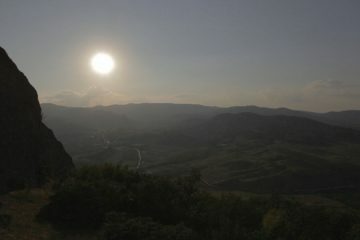 Batchen reveals that in our general reading of images we tend to understand the obvious, the very wide field of unconcerned desire, of various interest, usually a collection of visual features intentionally coded in the photography by the photographer and recognised by the spectator as a consequence of shared knowledge. The punctum lies with the unobvious, the random pixels residing in the image like an unknown unwanted detail. These elements within Vernacular of File Formats break the norm of what we know to be a visual representation of a self portrait. 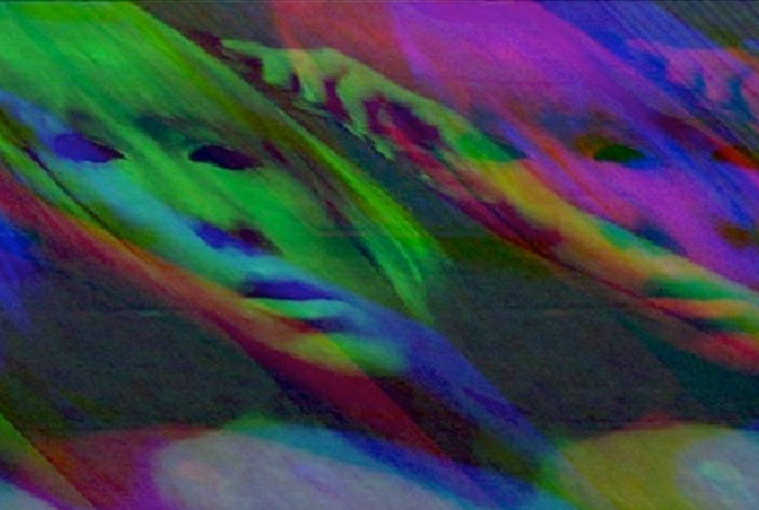 Some of us may interpret familiarity with the distorted glitch look, a consequence of engagement with digital technology. We may have experienced this with our digital TV or computer crashing. It generally has negative connotations of the unwanted, an annoying disturbance. In Menkan’s work, she highlights this, sees it as positive and gives us the opportunity to engage with it in a different way. 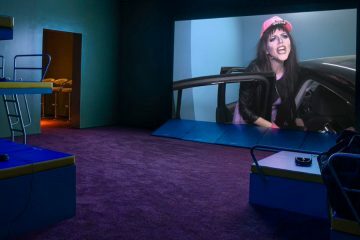 As Smith says “The punctum is more of a personal response to certain details in a photograph that “wound” or pierce an individual viewer- punctuating or breaking through between the trained reading of the studium”. These specks and lines and individual pixels and artefacts disturb and distort and that is where the punctum lies with this artwork. It could be argued that Menkman’s work although it highlights errors and glitches, it is intentional. Barthes observes that it is unintentional detail that strikes him as a punctum and could not do so had it been intended by the photographer. Barthes discuses that the punctum could not strike him if it had been intended. We can see that much like the punctum the glitch it is an unintentional event. 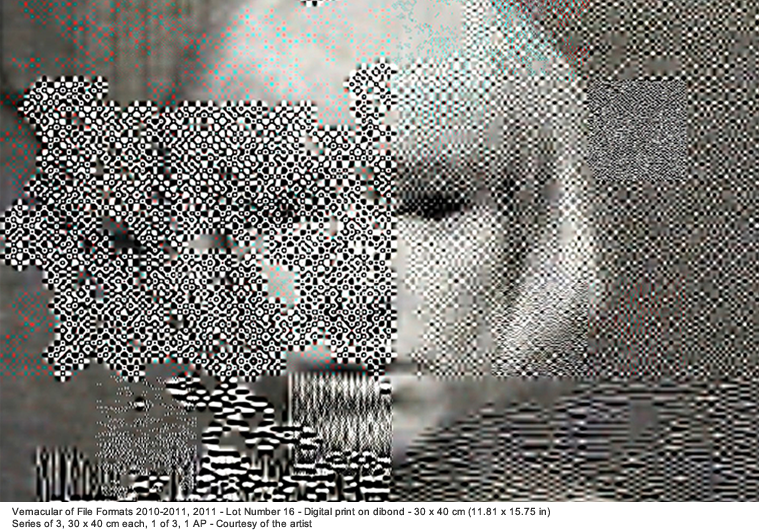 A fascination, an accidental aspect, glitch can be a curiosity in technology and also in art. It could also be the case that the glitch is intentionally constructed but unintentionally emerges as part of the art object. 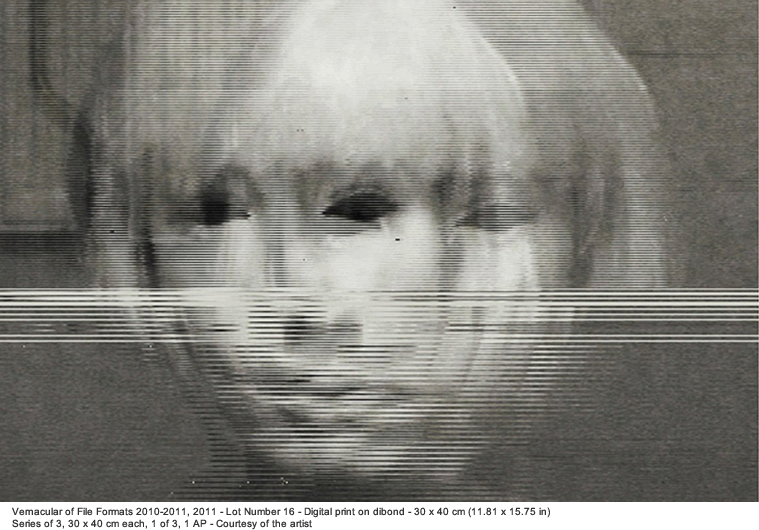 In comparison with the punctum, glitch art can form an impression on the viewer whether intentional or unintentional. One may perceive glitches without knowing how they came about. 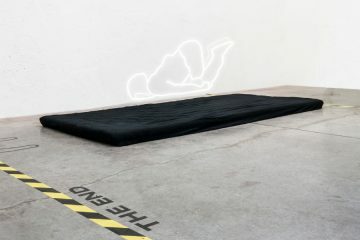 The glitch like the punctum is a visual slip or accident that rips through its medium to disrupt a flow of information. The interruption releases a critical moment and potential that forces the viewer to reflect on technology. The aesthetic of the glitch can have a tendency toward fragmentation, a breakdown. Like the effect of the punctum, it is what fascinates insofar as its ability to highlight an error, a mistake and the intriguing. 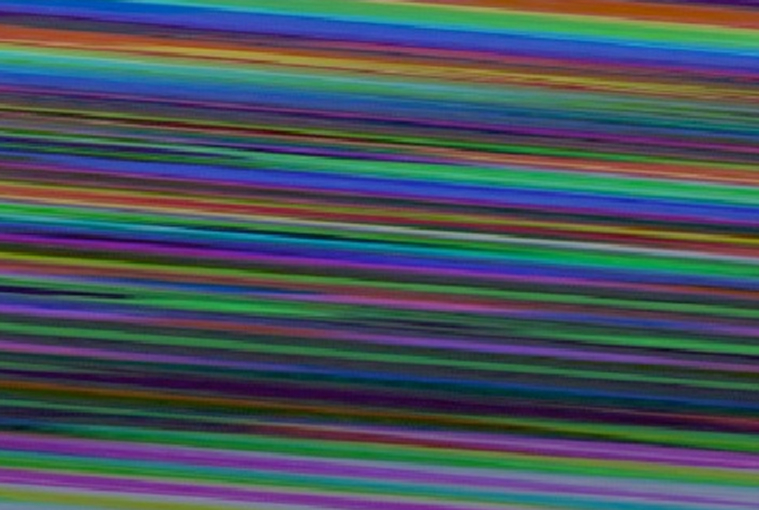 Does glitch art puncture and evoke a sense of emotional intensity to the viewer, like it did for Barthes? For Menkman her fascination is like Barthes the sense of the unknown, an arbitrary that catches attention. “The glitch is a wonderful experience of an interruption that shifts an object away from its ordinary form and discourse. For a moment I am shocked, lost and in awe, asking myself what this other utterance”. 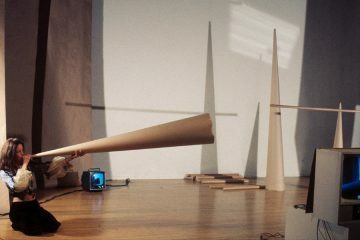 By allowing inadvertent detail into her artwork these transmissions spark intrigue and have the potential to pierce us. 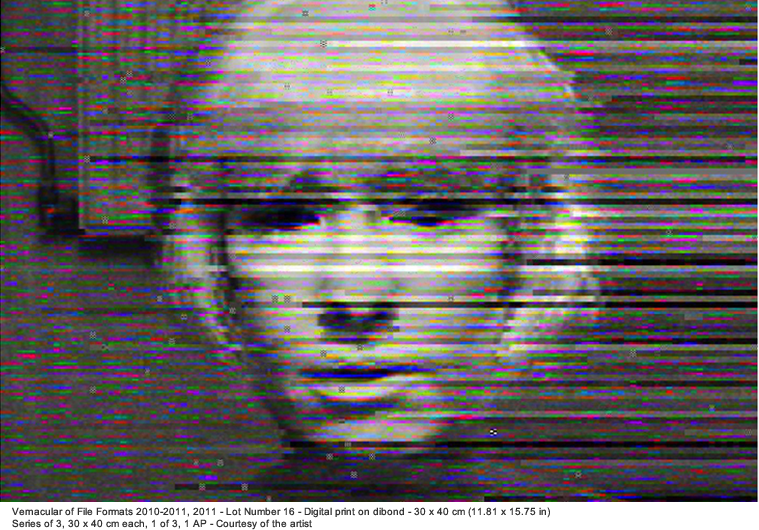 We are accustomed to the digital transmission, one of streaming smoothness, when this is interrupted it can have a jarring effect.The glitch tries to sustain an interest and sense of curiosity whether it be photography, computer, video or any analog or digital new media. What is of particular interests is the idea of the glitch as the punctum. In the 21st century are we like Barthes still trying to find the punctum within the machine? In conclusion what we can learn from Barthes theory is that, through his engagement with the punctum, we can relate to the element of the unpredictability and disruption to our visual field. How we read an interact with art, is to look for the punctum. It is this that makes experiencing a contemporary art work worthwhile and rewarding.